In 2011, a group of Hong Kong water activists and researchers traveled the length of the Dongjiang (East) River, which stretches from northeast Guangdong Province into Hong Kong’s New Territories, to investigate the challenges facing the watershed. The Dongjiang basin, which provides nearly 80 percent of Hong Kong’s water supply, has suffered water shortages due to the region’s increasing urbanization and industrialization. They found unchecked wastewater discharges—from agriculture, poultry farms, chemical plants, tanneries, and even an open-air quartz quarry—were dangerously degrading water quality. Six years later, a delegation from the Hong Kong government retraced the journey, hoping to find that officials in neighboring Guangdong had made improvements in water quality and conservation. During the 20 years since Hong Kong was handed over to mainland China, cooperation between Hong Kong and Guangdong on many environmental challenges has gained traction—with the notable exception of water management. Due to an unfavorable fixed price agreement between the neighboring governments and a lack of sustainable supply, Hong Kong finds itself paying too much for too little. Hong Kong and Guangdong’s energy and environmental infrastructure are tightly intertwined. 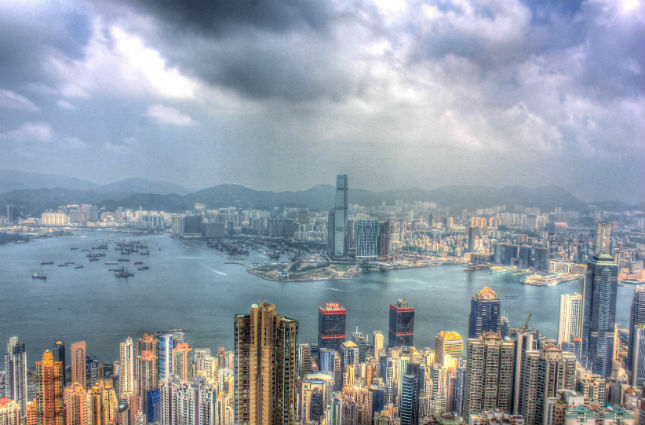 In addition to Hong Kong’s dependence on water from the Dongjiang, concerns over cross-boundary air quality, energy, and food supplies strain the relationship between these two cities. Hong Kong relies on Guangdong nuclear power plants for as much as a quarter of its electricity, sparking fears of a major nuclear accident; air pollution from Guangdong’s factories drifts into Hong Kong; and Hong Kong imports 95 percent of its food, a large portion of it from Guangdong. Guangdong, too, suffers from insufficient supplies and poor quality of water. When polluting industries—like textile dye plants or tanneries—have poured too much wastewater or too many chemicals in one area, local authorities are forcibly relocated to another part of the province, exporting the pollution to new areas. While there have been recent improvements in the watershed, growing cities and increasing industrial and agricultural development continue to lead to pollution from excessive use of heavy metals, organochlorine pesticides, PCBs, and wastewater discharges. Like Guangdong, Hong Kong has made modest efforts to improve its water quality and stretch its water supplies through innovative practices, such as utilizing seawater for toilet flushing. However, the cross-boundary problems extend both ways. More than half of Guangdong’s polluting businesses are financed by Hong Kong, including industries relocated inland during the 1980s. 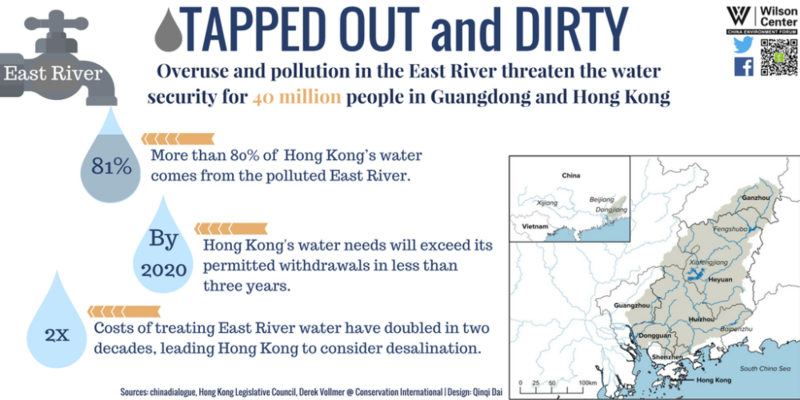 Similarly, when polluting agricultural activities were forced out of Hong Kong to reduce water runoff, the move simply increased water pollution problems in Guangdong—providing only momentary reprieve for Hong Kong, as the pollution eventually flows back across the border. The interconnections between Hong Kong and Guangdong prove that environmental issues that cross boundaries, like water quality, require an integrated management approach. Cross-border cooperation between China and Hong Kong should be significantly expanded, in the context of the “one country, two systems” relationship. However, the governments have made only a few joint efforts to address their water issues; a similar story has played out across China, where most upstream provinces are hostile to any overtures from downstream provinces to cooperate on water. Hong Kong participates in a few information exchanges and monitors waters from the Dongjiang at its own intake facilities, but has no formal role in directly addressing quality and supply of the water, which is increasingly coveted by other fast growing cities in Guangdong. An effective demand management approach—recognizing that water is a scarce resource and focusing on how it is used rather than on obtaining new supplies—is key for both Hong Kong and Guangdong. Sharing best practices of efficient water usage, pollution control, and water recycling would help stretch scarce supplies. Hong Kong’s new wastewater-to-energy plant—which doubles as a recreation and education center—could be a valuable model to share with its counterparts in Guangdong and other cities in China, where few wastewater plants capture methane to generate electricity because of numerous market and policy obstacles and low levels of organic material in the water from excessive storm water runoff. Combining this demand-side approach with the sustainable management of watersheds would help bolster a new type of water ethic for both Hong Kong and Guangdong that focuses on the community value of water rather than its commodity value. Greater input from community stakeholders (potentially though a Watershed Council) could help governments identify both the sources of—and potential solutions to—environmental problems that would benefit all of the people dependent on a watershed. Environmental protection across political borders necessitates a close relationship between people and places, democratic participation, and a new community-based ethic that values meeting the needs of people and the environment. Robert Gottlieb is Emeritus Professor of Urban & Environmental Policy and founder and former director of the Urban and Environmental Policy Institute at Occidental College. Simon Ng is an independent consultant and former chief research officer at Civic Exchange, a public policy think tank in Hong Kong. They co-authored Global Cities: Urban Environments in Los Angeles, Hong Kong, and China, published by MIT Press (www.globalcitiesbook.com).